Per- and polyfluoroalkyl substances (PFAS) have been making their way into New Jersey’s drinking water supplies, the blood of Americans, and most recently, news headlines as their potential impact on public health becomes more clear. Where can you learn more? 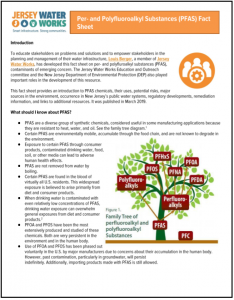 To advance Jersey Water Works’ goal of educated, empowered stakeholders, Louis Berger developed this fact sheet on PFAS. It provides an introduction to PFAS chemicals, their uses, potential health risks, major sources in the environment, occurrence in New Jersey’s public water systems, regulatory development, remediation information, and links to additional resources. The resource was published in March 2019 with help from the New Jersey Department of Environmental Protection (DEP) and the Jersey Water Works Education and Outreach Committee. PFAS, a set of synthetic chemicals, is contaminating certain drinking water sources in New Jersey, including surface water and groundwater. PFAS are used in a wide variety of consumer products, making them virtually impossible to avoid, and certain PFAS are found in the blood of virtually all U.S. residents. Exposure to certain PFAS through consumer products, contaminated drinking water, food, soil, or other media can lead to adverse human health effects. Legacy contamination, particularly in groundwater, will persist indefinitely. Importing products made with PFAS is still allowed. There are various ways in which PFAS can enter the human body, and according to the US EPA, exposure can lead to adverse health outcomes in humans. There are various pathways by which PFAS can enter the environment (air, water runoff, solid waste) and various media in which PFAS are found. New Jersey has implemented the nation’s toughest standards for regulating PFAS. DEP has implemented rules, standards, or guidance for PFNA, PFOA, and PFOS in drinking water or groundwater. While legacy contamination may persist indefinitely, use of PFOA and PFOS has been phased out voluntarily in the U.S. by major manufacturers due to concerns about their accumulation in the human body. DEP has proposed rules for PFOA and PFOS, including maximum contaminant levels (MCLs), groundwater quality standards (GWQS), and inclusion on the New Jersey Right To Know Hazardous Substance List. The proposals are currently open for public comment. DEP continues to perform testing on occurrence, health impacts, and environmental remediation. The tate attorney general and the DEP have filed lawsuits against private polluters to pay for investigating and remediating sites contaminated with PFAS.